I bought a Photosmart C 4795 in the US. The ink catridge is HP 60 black (CC640W) and HP 60 tri-colour (CC643W). Now I've tried a HP 300 ( as you suggest) on your website. Is there something I should do to make the HP 300 ink cartridge work or can you deliver the HP 60 cartridges? Best regards, Bo Jansson. Like DVDs, cartridges have region codes and different numbers based on where the printer was purchased. The cartridges we supply (HP 300) will only work in this model of printer if it was purchased in the UK. All of the cartridges we stock are UK cartridges and we are unable to supply the cartridges you require. If you have been using the HP 60 cartridges previously, you will need to find cartridges with the same codes to work in your printer. I would recommend doing a Google search to find a company that can supply these. Alternatively, you could contact HP directly, they should be able to supply the cartridges you require and can even help change the region code of your printer. Where is the most extensive choice of HP C4795 ink cartridges? Shopping around just for replacement ink is another time intensive problem, even more so if it means needing to go to all sorts of shops. Nevertheless, changing C4795 ink doesn't always have to be a difficult experience. Purchase all of your HP C4795 inkjet cartridges here at Cartridge Save. HP C4795 Inkjet Cartridges With Totally Free Next Day Delivery! You'll get next day delivery on any order of bargain HP ink, regardless of how much you order. Any HP C4795 printer cartridges purchased off Cartridge Save are always protected by a money back assurance. In the event that you have got complications, merely mail us the goods for a full refund. You do not want to lose out with prices that are so low! 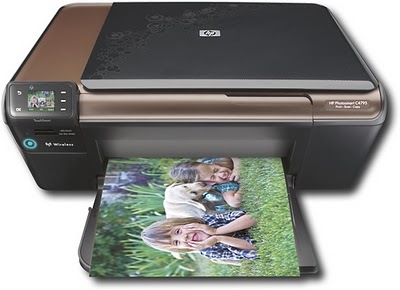 The HP Photosmart C4795 is an elegant-looking multifunction printer often praised for being inexpensive, speedy, and for excellent connectivity features. While it seems high-tech for a basic All-In-One printer, it is (unfortunately) limited in terms of efficiency and performance. Ink cartridges are expensive, too. This sleek and stylish printer weighs 10.5 lbs and measures 17.6 x 17.4 x6.7 inches. The HP Photosmart C4795 is a 3-in-1 device that scans, copies, and prints, and is equipped with WiFi so you can print directly without connecting it to your computer. It features additional memory card slots, a fairly-sized colour LCD screen, and an easily-accessible control panel. The HP Photosmart C4795 gives you more flexibility with its many connectivity options. The device is fairly fast and quiet for a thermal inkjet printer, and setting it up is easy. The control panel is user-friendly, and there seems to be no compatibility with Windows, Mac, and Linux operating systems. This All-In-One printer may be inexpensive, but running costs are high as replacement inks are expensive. Some users also complained about difficulty in getting support from HP when the warranty expires. The paper feed jams all the time. The print quality of the HP Photosmart C4795 is excellent on plain paper, but deteriorates on cards and thicker media.